ShoppingCartMart.com uses SSL (Secure Socket Layer) encryption when transmitting certain kinds of information, such as financial information or payment information. An icon resembling a padlock is displayed on the bottom of most browsers window during SSL transactions that involve credit cards and other forms of payment. 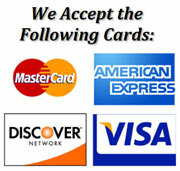 Any time we ask for a credit card number during checkout for payment, it will be SSL encrypted.